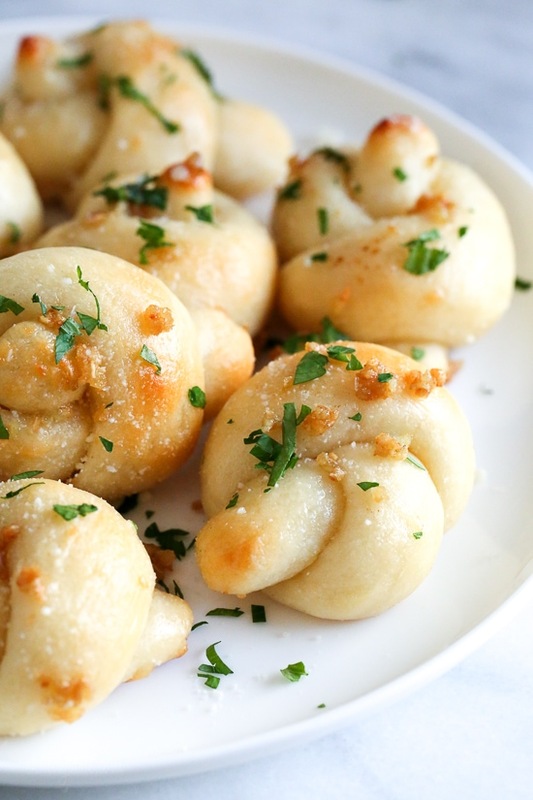 These soft, garlicky knots taste just like your favorite pizzeria’s garlic knots! Made from scratch using my easy yeast-free bagel dough recipe (just flour, Greek yogurt, baking powder and salt), they can be baked in the oven or cooked in the air fryer! No need to wait for the dough to rise, no fancy mixer required, just mix it, roll and bake, they are so good fresh out of the oven (or air fryer)! Great served with a salad, a bowl of soup, or serve them with marinara as an appetizer! Because they are made with Greek yogurt, they are also high in protein and lower in carbs than traditional knots. I topped them with just enough butter to saute the garlic then tossed it all together, they disappeared fast! Guys, we are so obsessed with this bagel recipe that Tommy wanted to make them into his favorite garlic knots. We’ve made them twice now and they turned out delish! Serve them with a big bowl of tomato soup and a salad and you have yourself a delicious dinner the whole family will be excited about. You can double or triple the recipe for a crowd, you can also make half the dough for less servings. To make the dough ahead, wrap tight in plastic and refrigerate 2 to 3 days. Let the dough get room temperature before baking. I recommend a silpat or silicone baking mat to prevent them from sticking or browning too much on the bottom. They will expand when they bake so you’ll want to make sure they have plenty of room so they don’t stick together. Thick Greek yogurt instead of plain is a must, if there’s any liquid in the yogurt be sure to drain it. I tested with Fage and Stonyfield Greek, both worked great. 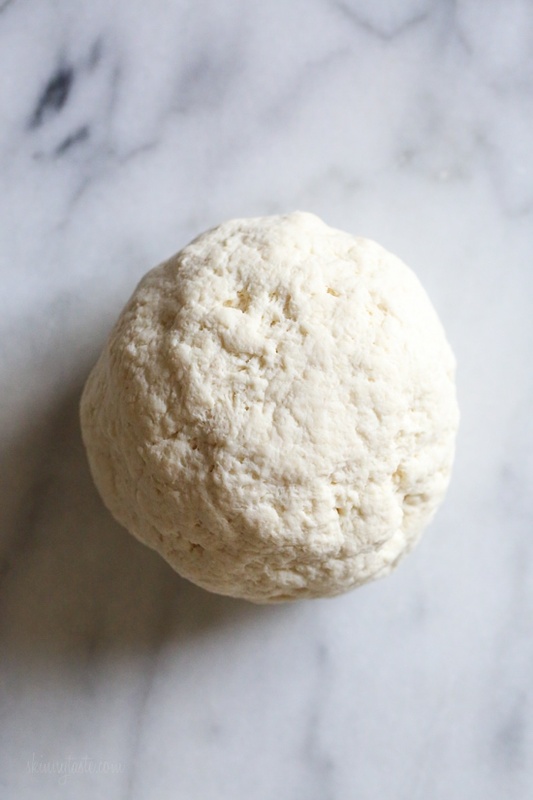 If your dough is sticky add more flour or use slightly less yogurt. White whole wheat flour can be used in place of all purpose. 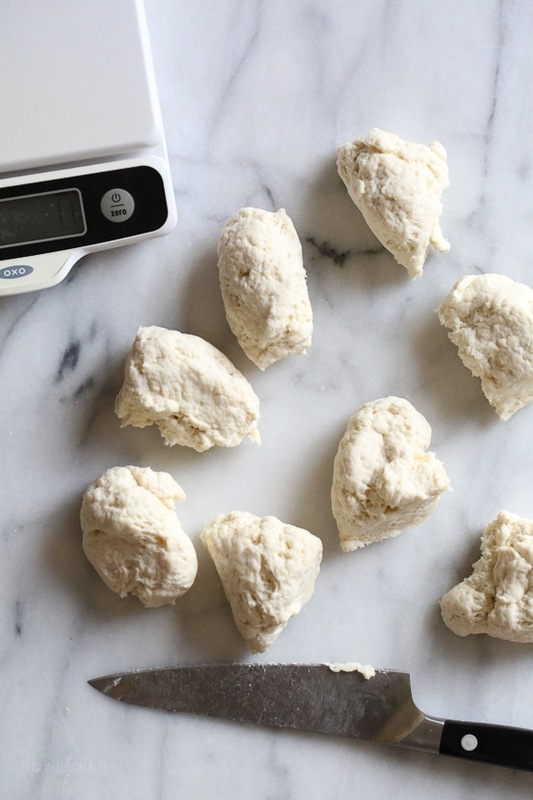 A food scale is helpful to weight your flour and to make sure your knots are all the same size. This is the food scale I use (affil link). To make them gluten-free I use Bob’s Redmill 1 to 1 flour and increase the bake time by 5 minutes. 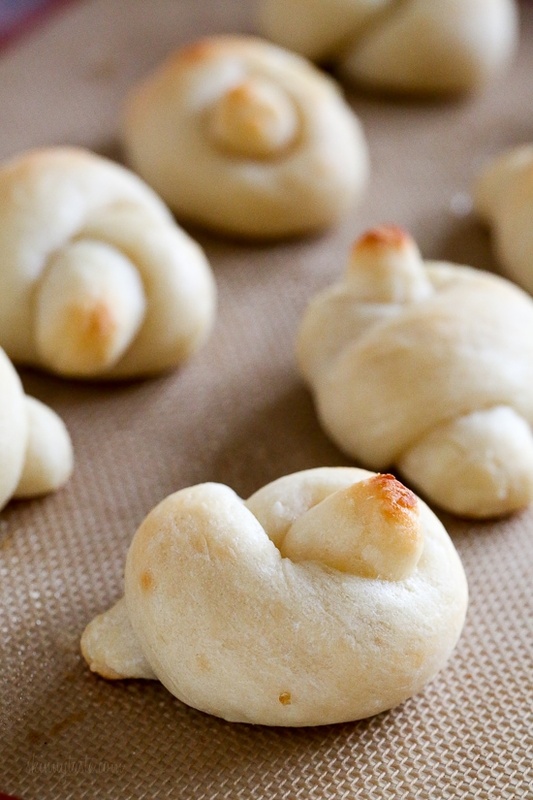 If they are too hard to make into knots, just make them into bread sticks. 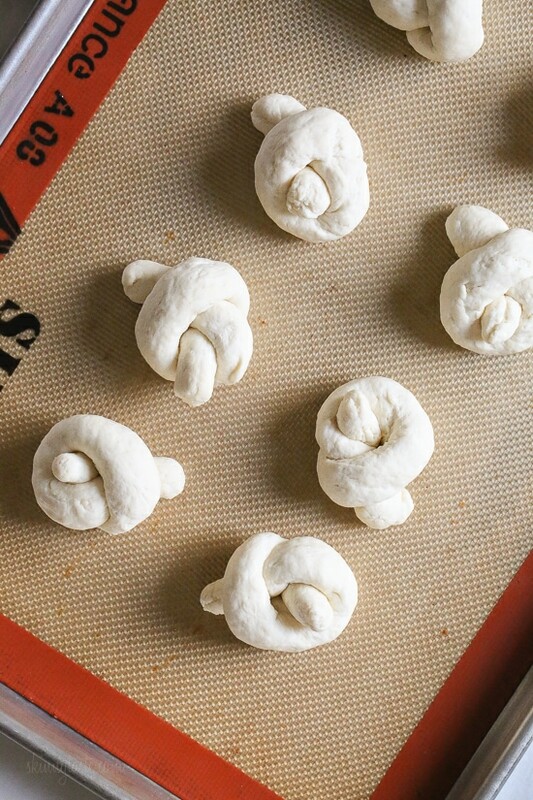 These soft, garlicky knots taste just like your favorite pizzeria’s garlic knots, but made from scratch using my easy yeast-free bagel dough recipe (just flour, Greek yogurt, baking powder and salt). Preheat oven to 375°F. Line a rimmed baking sheet with a silicone liner or Silpat. In a large bowl combine the flour, baking powder and salt and whisk well. Add the yogurt and mix with a spoon until incorporated. Then use your dry hands and knead about 15 times. If it’s too sticky you can add a little more flour. Roll into a ball. Divide the dough into 8 equal pieces then roll each piece into worm like strips, about 9 inches long. Tie each breadstick into a “knot-like” ball; place on the prepared baking sheet. Spray the top with olive oil. Bake on the top third of the oven until golden about 18 minutes. Let them cool 5 minutes. Meanwhile, in medium nonstick skillet melt the butter, add the garlic and cook until golden, 2 minutes. Toss the knots in the skillet with the melted butter and garlic or use a brush to cover the knots with the garlic. If the knots are too dry, give them another mist of olive oil. Sprinkle with parmesan cheese and chopped parsley. Preheat the air fryer 325F degrees and set for 11 to 12 minutes. Cook in batches without overcrowding and bake 11 to 12 minutes, or until golden. No need to turn. 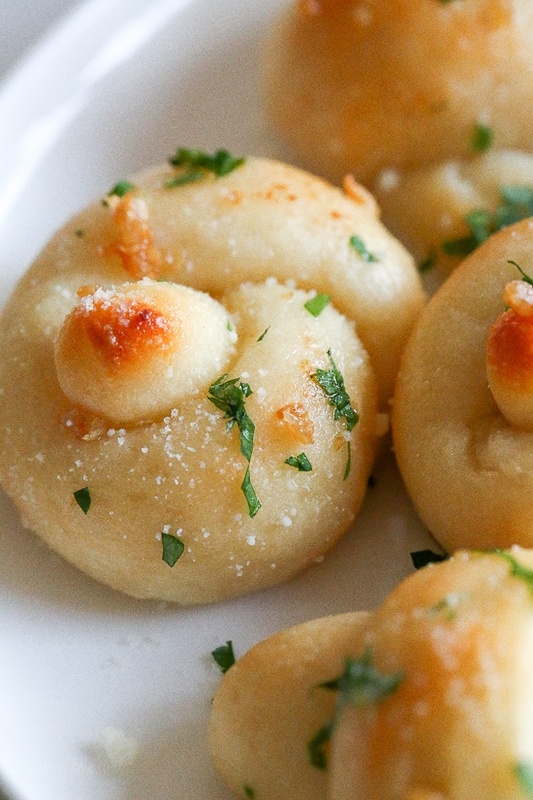 I can’t tell you how much we enjoyed these easy garlic knots! I’ll admit that I was a little dubious to begin with, but they were so quick and easy to throw together and tasted just like the dough balls at our favourite pizza restaurant! Even my super picky five year old loved them! I made them again today, but rather than a knot I made them into dinner rolls and skipped the garlic butter. The points value is still the same according to the WW app, and they were just as delicious. Holy Cow!! These were great – I made a double batch . However, reheating the leftovers in the microwave the next day – FREAKING AMAZING! Can you use regular whole wheat flour? If so, does anything change? This is such a great recipe! Easy and delicious. I made these with 2% Fage Greek yogurt and bought new baking powder. They came out wonderfully! I’ve tried these before with whatever greek yogurt I had in the fridge, but the dough was way too sticky to work with. Follow her advice and use the recommended yogurt. I did add some sprinkles of garlic powder after brushing with the garlic butter, but that’s because I like stronger garlic flavor. Do yourself a favor and give these a go. I can’t believe it took me this long to try this recipe. I was drooling when Gina first posted it. I’ve been making the bagels on a regular basis. These knots were incredible! So good I ate a leftover one for breakfast cold and it still tasted amazing. I actually have luck with the Chobani yogurt. You just have to handle it lightly when working with it. Thanks for another great version of the yogurt dough! Gina, have you tried to make pretzels with this dough? If I cook in AF, do I put topping on after they come out or before they go in like the bagels? I love the bagels and do them a lot. I’m sure these will be just as good. If I do in air fryer, put topping on after they come out or before they go in like the bagels? have anyone tried this recipe with using coconut flour? I pretty much exclusively cook skinny taste recipes and I tried twice (back to back) to get these made and they are so sticky I can’t finish them. I added so much flour, to make them less sticky, and it just didn’t work. I am frustrated, I am following the recipe exactly. Any suggestions? Sounds like its the yogurt, what brand are you using? I had the same problem but I’m using Greek Gods plain nonfat Greek yogurt. (It works great with your Yogurt Waffle Recipe!) I’ll have to try to find another brand next time. 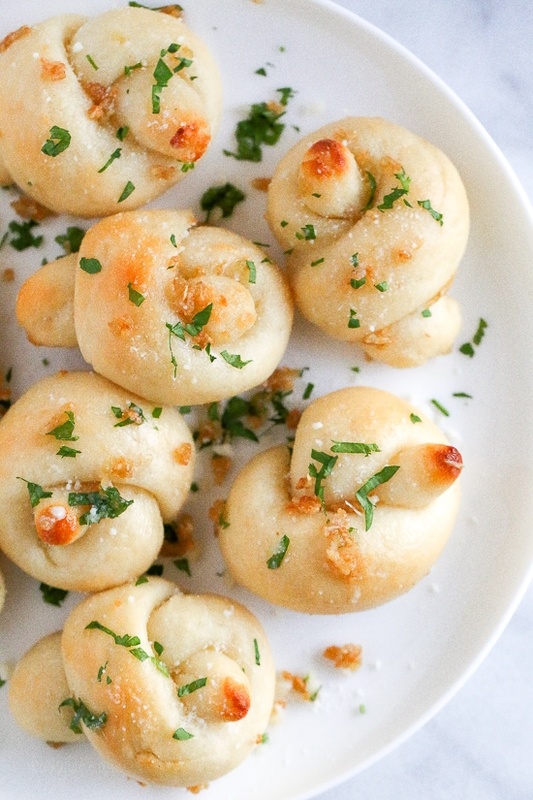 I’m determined to make these delicious garlic knots. These are delicious! I’ve made them several times for my family and the hubby and kiddos love them! Thinking of tripling this recipe for a holiday dinner and wondering if the dough can be made in the morning and baked in that evening??? I’ve made these several times for my family and they are a big hit! Wondering if you have any suggestions for prepping these bad boys ahead of time(ie earlier in the day to bake for Christmas dinner? I can’t bake, I fully accepted this problem and didnt think I would ever confidently say I baked something… that was until I decided to give this a try and let me tell you. It worked. Ya girl can bake a fluffy tasty garlic knot and not a brick. Like a magician I wowed my husband and now he wants more. I’ve made this twice, the second time adding the garlic, chives and cheese into the dough giving it a sour cream and onion kind of flavour. I would highly recommend trying that. I will surely be making these often and have gained some confidence in baking. 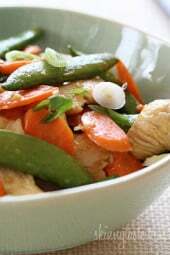 Thank you for sharing this delicious recipe. 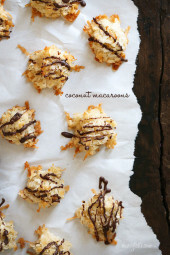 I made these using half brown rice flour and half oat flour, and they turned out great! I also subbed ghee for the butter, which worked very well! They are delicious! Made these tonight and they are amazing! Made the chicken lentil soup as well and that’s what we’ll be having for lunch tomorrow. So delish and easy to make! I was skeptical of these at first, but wow! They were super quick to whip up, easy to roll and bake and they were so good! My family ate them so fast I’m not even sure they tasted them! Definitely keeping this recipe in the rotation! These really are easy and yummy. Trust me, you should double the recipe because you will want more. This recipe is so easy! My family loves this recipe. We have stopped buying Texas Toast and the like because these knots are so much better and less calories!! I just made these and they were delicious. I had a slight problem with the dough being overly sticky and added more flour. Should I use less than a cup of the Greek yogurt???? I Love all of your Books I now have 3 of them including the newest!! But could you please tell me how to tell which of your books each of your online recipes are from? I know I can look in each one but sometimes i am on here and go from here with the recipe or im not at home and at a friends and we decide to cook something up. The recipes in my cookbooks are different than the ones on my website! I used light spelt flour as common wheat/all purpose causes inflammation and aggravates my arthritic knee. I weighed out 120 grams of flour and dropped in what might have been 3 ozs of fage non fat Greek yogurt. It came together while I wAs mixing but it was stickier than I preferred. I make my own bread, so I know how the ball of dough should feel. I sprinkled 1 tsp of flour into the bowl to cover, rolled the balls in the bowl and then my palms, allowing it to rest again for 15 mins it took too long to roll, so instead, I stretched each ball until it was long enough to tie into a knot. i baked them on my pizza Stone with some parchment paper underneath. They required about 15 mins to bake. Once done i rolled them in melted ghee and Instead of garlic, I used everything but the bagel seasoning ( this has added salt, so I used very little salt in the dough). These were absolutely fantastic!!! I wish I could add a picture of the steps and the finished product. The outsides are lightly crispy and the insides have the perfect amount of softness. I’m going to try the bagels this weekend. These are delicious and they work every time! We love them with soup and Chili! OH MY GOSH this recipe is amazing!! My husband was so impressed when I made these. He said they tasted just like we’d got them at a restaurant. They were so good in fact, he asked me to make them again later that week. These are fabulous and easy! Can you tell me what I did wrong? I made these, and even after cooked, I could still taste the tang of the Greek yogurt. I followed the directions exactly. My 9 yr old daughter made these and we used Chobani yogurt. It was too sticky (I just happened to read the step to use less yogurt…but we used more flour.) I took some of the garlic and incorporated it into the dough…my daughter ended up making them into hearts instead and brushed a little olive oil since we didn’t have cooking spray on hand. These little “heart knots” were sooooo good that I think we will try it with Fage yogurt next time and use less of it, perhaps. Nevertheless, these were fantastic! Why did my “dough” turn into this really liquidity mixture after just combining flour mixture and the yogurt? 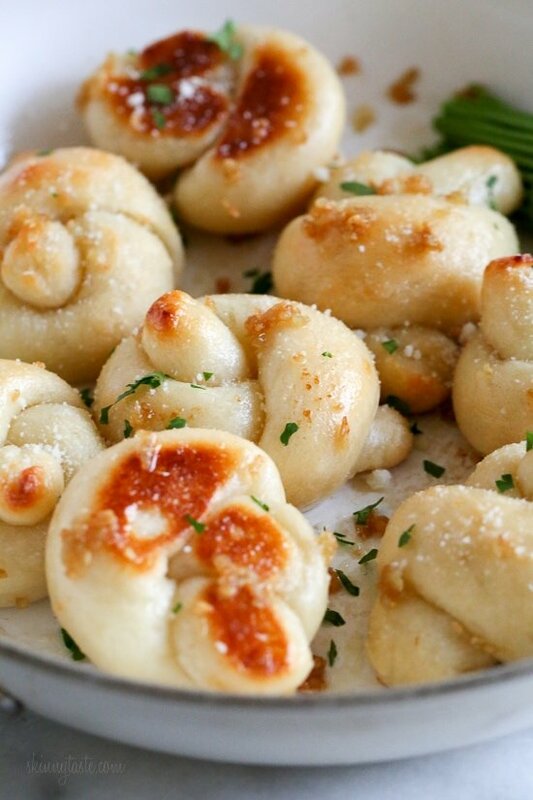 I have made these garlic knots and they were a big hit. I live at sea level but currently on vacation and want to make them. Vacation cabin is at 3700 foot elevation. I baked cookies the other day and they had a problem due to altitude. 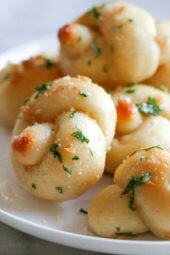 Any suggestions for baking garlic knots at higher elevations? More flour? Higher cooking temperature?Thanks for your help. I love your recipes, look forward to the weekly meal planner and have two of your books. I am also a Weight Watcher. Honestly I am not sure, let me know if you figure it out! Made these today for the first time. Formed them into an open ‘donut’ shape because some reviewers said theirs didn’t cook in the middle. Also used my pizza stone. Just had a taste – I’ll be making them again! Thanks Gina, I also appreciate your weekly meal plans. 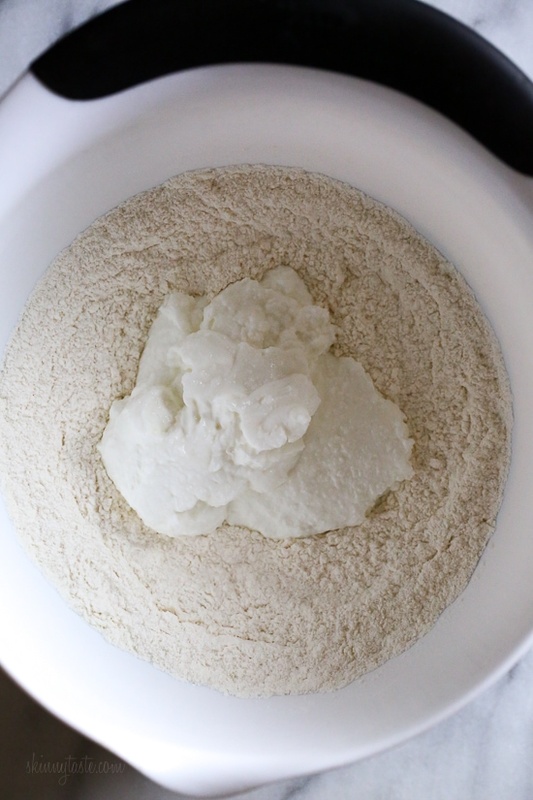 can I use self-rising flour instead of all-purpose flour, baking powder, and salt? Genius! Is there anything you can’t make?! I love to cook, and want to thank you for continually inspiring me to cook great healthy, satisfying dishes! We had a rainy cool day here this week so I made these with baked chicken parmesan and a salad. They were fantastic, we were fighting over the last one!! I’ve made these several times in the oven and really like the flavor, but like another reviewer, cannot get them to cook! They are quite doughy/almost raw in the middle. I have tried more flour, baking longer, etc, Any suggestions to fix would be most welcome!! 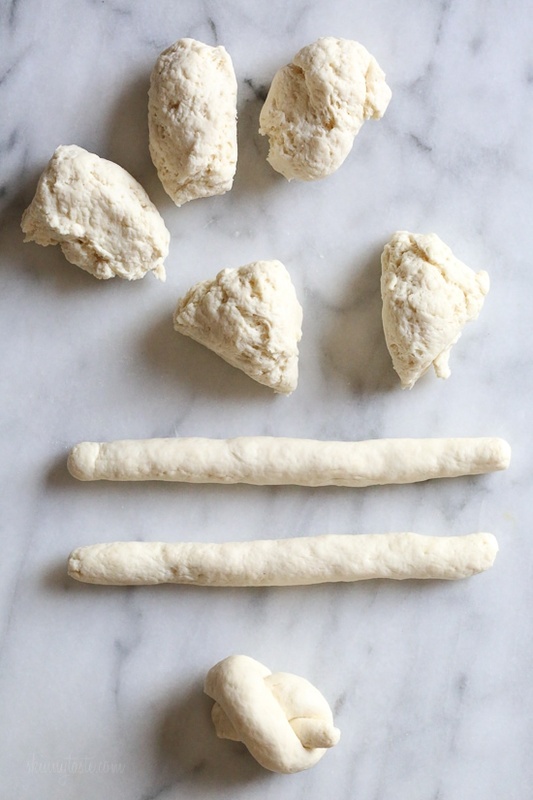 PS–I followed all of the directions, used Fage yogurt, and also tried the no-knot bread stick shape. Delicious!! My family absolutely loves these! I made them with your Shrimp cakes and spinach salad. As long as we have your recipes, we would rather eat at home! Made theses tonight and everyone loved them! Thank you! I made these on Sunday and they were good. My family loved them will have to make them again. So easy and delicious. Great healthy roll recipe. Loved! Definitely taking these to the next family get together. So easy and fast. I think I used a bit too much flour but other then that this recipe turned out GREAT! I can’t believe it worked with so few ingredients and was delicious! I actually think these garlic knots taste better then my favorite pizza place’s! Amazing and delicious. I will make them again and I want to try the bagels next. Can I use unbleached flour? 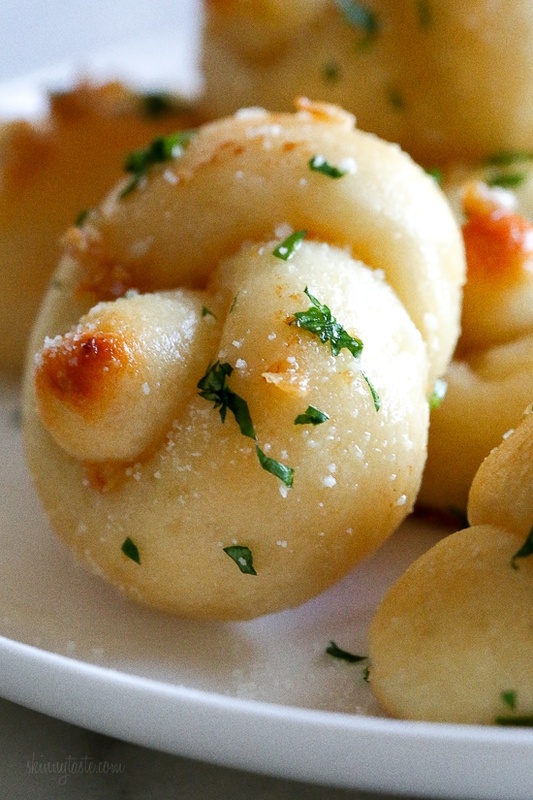 I have been making these garlic knotts 1-2times a week since they were posted! Sooooooo yummmy! Husband, Daughter and myself are in love with these garlic knotts that dont put on the pounds!!! Thank you so much Gina! I use my air fryer. Why can’t you use regular Facebook yogurt. I tried it br accident it seemed to work well. It doesn’t have to tangy tadse. I love these! I make them at least once a week. I made these and they were a big hit and so easy to make. Delicious recipe! My family Loved them… We each pitched in to make them and we had a lot of fun doing so. Do you have any suggestions for a substitution for the Greek yogurt? My son is lactose intolerant usually Greek yogurt he can handle. Thank you in advance. Amazing! And so easy! Thank you for sharing all of your hard work! What would be the best way to re-heat after freezing? Wrapped in foil back in the oven. Can you use the self rising flour instead of the baking soda combo? Thanks!! Hi..I don’t have an air fryer…can this recipe be baked in the oven..if so, what temperature and for how long? 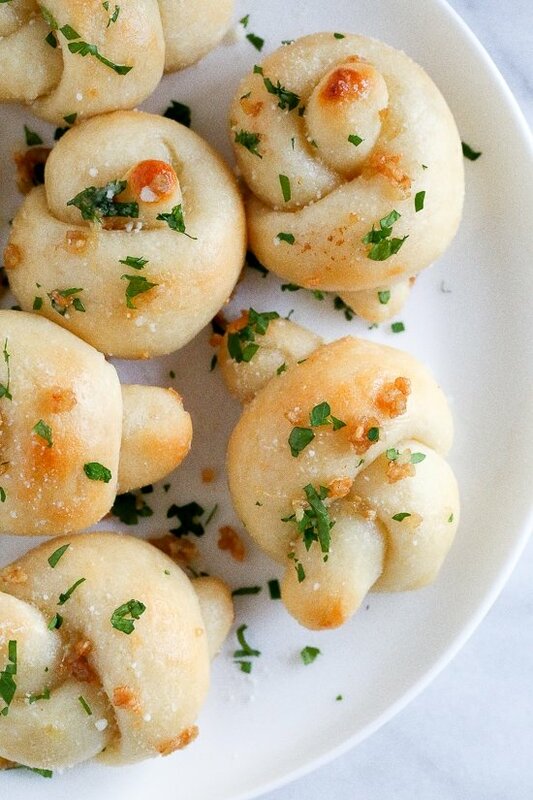 These garlic knots look amazing! Can you use almond flour instead? SIL is glucose intolerant. I was going to ask as well, sad we can’t sub almond flour!! I can now make a basic bread in less than 30 minutes. Thank you! I can’t believe how simple this recipe is and I’m loving the results! These are amazing, thanks for a delicious and simple recipe! Tried these after a few attempts at the bagel recipe as well. Loved that I could have a GF option and not feel deprived while the rest of my family has bread galore! I had a bit of a hard time getting the butter/garlic mixture on at the end, but otherwise they were easy (surprisingly made the knot shape without struggle!) 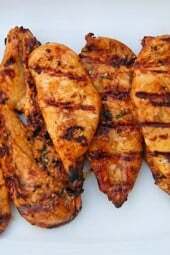 I make them in my air fryer and they turn out wonderful! I made them tonight. They are delicious but did not cook all the way through the middle. They were brown on the bottom and golden on top so cooking longer would have resulted in burning. I used a silpat and baked in the top of the gas oven. Wonder if I should lower the heat and cook longer next time. All ovens are different. I made them for the first time last night along with your Fagioli soup! OMG! I wanted to eat the entire 8 garlic knots! lol. I made these last night and they are SO good and SO easy to make!! Thank you for the awesome recipe!! They are the best I’ve ever eaten!! I will make them over and over again. So easy and I get to use my airfryer! So delicious! Thank you- the instructions worked perfectly! I didn’t have Parmesan cheese but they were still amazing without! Oh my goodness, these were fantastic!! Thank you so much for sharing this recipe! god gosh I should have made a double batch! these were easy and delicious and my family gobbled them down right out of the oven. thanks!